Gout is a form of arthritis that occurs as a result of the build-up of uric acid in the body and the joint fluid (hyperuricemia). This accumulation of uric acid typically occurs when the body has difficulty processing certain protein substances called purines (PURE-EENS) that are found naturally in our diets. Gout usually starts with a sudden onset of intense pain in one or more joints, usually the big toe joint of the foot. The pain is accompanied by redness, swelling and warmth over the joint. Typically, the patient does not recall injuring the joint before the pain started. Many patients say they first noticed pain in the middle of the night or upon arising in the morning. While symptoms most commonly occur in the big toe joint, any joint may be involved. Other common sites are the instep of the foot, the ankle, or the knee. When the foot is involved, wearing shoes is difficult and painful, as are attempts to move the joint or stand on the foot. The diagnosis is based on a personal and family history, as well as on the doctor's examination which often finds the classic signs of gout and makes the diagnosis clear. Blood tests often are performed to determine uric acid levels, and the joint fluid is examined to look for uric acid crystals. 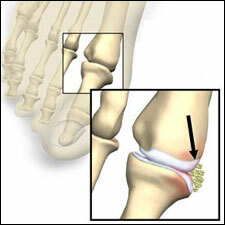 X-rays also may be performed to examine both the bones and joints to rule out abnormal changes associated with gout. The treatment of gout starts with establishing the correct diagnosis. Oral anti-inflammatory medications are most often used to manage the acute attack. While over the counter drugs may reduce symptoms, they are rarely strong enough to treat the acute pain, swelling and inflammation. If the gout attack is in the toe, it will typically help to elevate the foot, avoid standing and walking, and wear only a loose slipper until the individual can be seen by a podiatric surgeon. Gout often can be controlled with proper medication, both when there is an attack and on a long-term basis. It is important that your doctor establish which of the two primary causes (producing too much uric acid or not eliminating it properly) is involved in order to treat the gout with the appropriate medication. Certain foods that are high in purines can increase uric acid levels and thus bring on an acute attack of gout. These foods include red meats, shellfish, beer, red wine and salt. Some medications, such as diuretics (water pills) that are often used to control high blood pressure or reduce swelling, also may cause an acute attack of gout. Stress, infection, and trauma also are possible causes. Drinking 6-8 glasses of water each day, eating an appropriate diet, and evaluating current medications will reduce the likelihood of an attack or lessen the severity should it occur. If you have a personal or family history of gout, regular examinations by a podiatric surgeon also will reduce the potential for an attack.